PROTEIN2FOOD has received great visibility and recognition participating in the ‘Horizon 2020 Societal Challenge 2’ info week, organised by the European Commission on 14-17 November 2017 in Brussels. The info week revolved around the Horizon 2020 work programme for 2018-2020, providing funding opportunities for research and innovation on ‘Food Security, Sustainable Agriculture and Forestry, Marine, Maritime and Inland Water Research and the Bioeconomy’. Among a number of high-level policy events, there was one dedicated to the bioeconomy. Here, PROTEIN2FOOD was invited to take part in the Bioeconomy Village that highlighted first-class Horizon 2020 projects and initiatives in this area (see this article for further information). 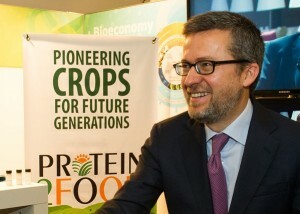 The event gave a unique occasion for increasing the exposure of the project’s outcomes, drawing the attention to the challenges and opportunities for high-quality, plant-based protein. We hope that our appearance at this event could help pave the way for a boost of sustainable plant-protein food production and consumption in Europe. 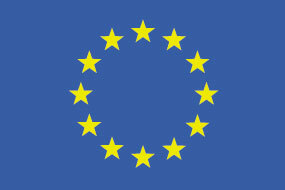 The European Commission invited PROTEIN2FOOD to be part of the Bioeconomy Village at the info week on ‘Horizon 2020 Societal Challenge 2’, the biggest EU research and innovation programme. Aside from presentations and discussions with policy makers, the Bioeconomy Village displayed the work of 20 high-class EU-funded projects and initiatives relating to the bioeconomy. Bioeconomy includes the production of renewable biological resources and the conversion of these resources and waste streams into value-added products, such as food, feed, bio-based products and bio-energy. The EU Bioeconomy Strategy paves the way to a more innovative, resource efficient and competitive society. Its aim is to provide food and nutrition security with the sustainable use of renewable resources, while ensuring environmental protection. PROTEIN2FOOD, with its ambition to create innovative, high quality, protein-rich food crops as well as products, has an important role to play in supporting the EU to deliver on its Bioeconomy Strategy. Commissioner Moedas, joined by MEP Simona Bonafè came to the PROTEIN2FOOD stand to ask various questions about the objectives of the project and about the work already done. Moreover, PROTEIN2FOOD received much interest from other policy makers, scientists and other visitors present at the event. They marvelled at the different showcased samples of seed groups (e.g. quinoa) or grain legumes (e.g. faba beans and lupins) and their protein-rich flours and isolates. PROTEIN2FOOD uses them for the development of innovative food products to replace animal protein. As an example, a prototype of protein-rich pasta, developed at University College Cork, was displayed. All in all, the people’s great interest and positive feedback emphasised the importance of the project and plant-protein as part of the solution towards a sustainable Bioeconomy in Europe. Have you ever tried a bread made from quinoa, or any other exotic or unfamiliar grains? The quinoa grain has been harvested by the Andeans in South America since Incan times, where it was referred to as the mother of all grains. Fascinated by quinoa and other protein crops, like amaranth and lupine, the PROTEIN2FOOD partners are developing new products to increase the consumption of these forgotten grains. One of the PROTEIN2FOOD partners, Universidad Nacional Agraria La Molina (UNALM), is located close to the origin of quinoa, at the foot of the Andeans in Lima, Peru. They produce seeds (e.g. quinoa and kiwicha) as well as legumes (e.g. lupines and lentils) and generate protein-rich prototypes of breads, cookies, pasta, dairy substitutes and other food products. They also develop recipes incorporating these Andean crops into the local cuisine. 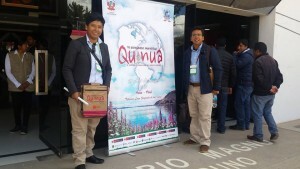 UNALM presented their research at the 6th World Congress of Quinoa, in Puno (Peru) March 2017. This city is located at an altitude of 3800 meters above sea level, at the Peruvian “altiplano” or plateau where ancient crops were first grown by antique Andean cultures. 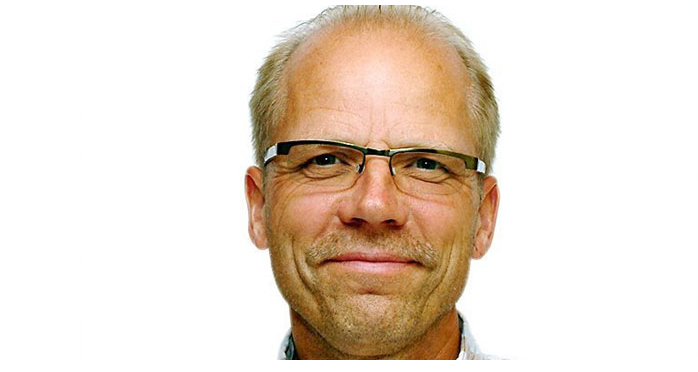 Sven-Erik Jacobsen, project coordinator and renowned scientist, travelled to Lima in July 2017. He visited PROTEIN2FOOD partner, Universidad Nacional Agraria La Molina (UNALM), to see their progress in research about ancient grains, such as quinoa. UNALM is working with a chef whose restaurant took second place in Lima’s best restaurants. Together they develop ideas and recipes for the culinary use of ancient protein-rich crops. They invited Sven Erik Jacobsen to taste their dishes. Lima has a rich gastronomic culture and is being praised as a candidate for the world’s greatest gourmet city! It’s full of creative young chefs benefiting from the diverse natural landscape and melting pot cuisine surrounding them. UNALM is not only situated in the centre of a gastronomic hotspot, but it also has a strategic location. Jacobsen celebrated the good accessibility to local agricultural institutes and the quinoa tradition as its centre of origin. The accumulation of all these factors made UNALM the perfect choice to carry out this work package. Knowing people’s needs and feelings about meat helps to develop the best strategy to promote alternative plant-based protein sources. 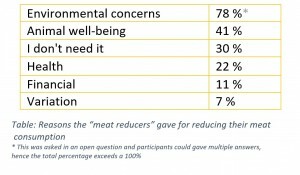 Therefore, PROTEIN2FOOD partner Louis Bolk Institute (LBI) from the Netherlands carried out a study, including 28 Dutch participants, to analyse their attitude towards the consumption of meat and their plant-based alternatives. The participants included in this study are the so-called “meat reducers”, which is one of three different consumer categories towards eating meat, as proposed by previous research.1 The other two groups are “meat lovers” and “meat avoiders”. This earlier investigation revealed that the majority of people in the Netherlands and the UK (50-70%2,3) belong to that group. Other Northern European most likely will follow a similar trend. Meat reducers are those people who have at least one meatless day per week, love to pick vegetarian options but still enjoy the occasional piece of meat. They are also known as flexitarian or part-time vegetarian. The biggest growth potential for plant-based protein products, LBI’s researchers hypothesise, may be settled in this consumer group, which makes it essential to learn more about their intentions, wishes and shopping decisions. The “meat lovers” (25-30%2,3 of the consumers) enjoy eating meat so much that they don’t want to give it up. They relate meat to their status as well as their identity and take pleasure in eating traditional meals instead of trying something new. 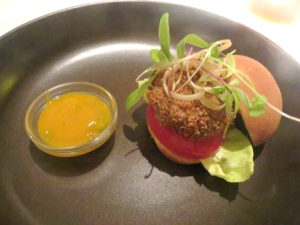 The recent trend is opening the stage for a less meat-centred eating culture. To support this movement, it is important to have attractive meat alternatives. Therefore, a following article will talk about the LBI’s product testing to investigate which plant-based protein food is popular and demanded. 3 Hoek AC, et. al. (2011). Replacement of meat by meat substitutes. A survey on person- and product-related factors in consumer acceptance. Appetite 56:662-673. “The answer to future global food challenges may well come from the past” is the introduction of Euronews to their 4-minute coverage of the PROTEIN2FOOD project.